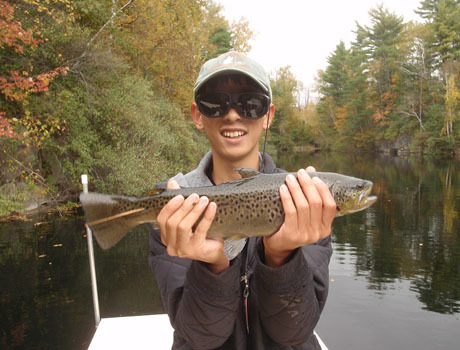 Zhiwei (Jonathan) caught this 17-inch brown trout with a bamboo fishing rod that he made with his host grandfather. Before coming to the U.S., Zhiwei (Jonathan) had never been fishing. He quickly became eager to explore the intricacies of trout fishing, including learning about the water, fish, and flies while fishing the ponds of upstate Connecticut. On his first trip, he caught nothing. On the second trip he caught a few small trout. Finally, on trip #3, he caught several larger fish, including a very rare tiger trout. As for his pole, Jonathan’s host grandfather helped him make a bamboo rod. He looks forward to learning how to make one from the ground up, which will take about 60 hours from start to finish!